Have you ever played Dragon Quest RPG game? Did you like it? If 'Yes' You know about this. It's shaped Dragon Quest's Slime, NIKUMAN (pork steamed bun). I bought this at Family Mart convenience store. 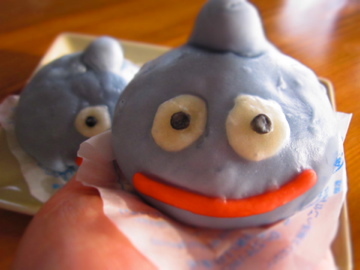 Slime NIKUMAN is 170yen. 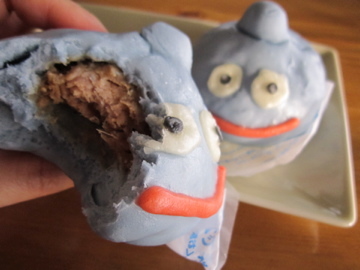 it's kind of expensive since normal NIKUMAN is 110yen at Family Mart. Well, It's fine. Honestly, It is adorable, but not so tasty.. I think blue color made me lost my appetite... Hmmmmm..
Well, That's OK. I enjoyed!